WebPT is the leading web-based physical therapy EMR solution, and is a favorite amongst physical therapists, with a 99% clinic retention rate. Founded in 2008 by an experienced physical therapist and a skilled technologist, WebPT was designed to provide an affordable, yet modern software solution that addresses the pain points faced specifically by physical therapists. Today, it is one of the most popular EMR and practice management solutions, serving more than 65,000 users across 9,500+ clinics. Given its large client base and powerful documentation and scheduling capabilities, WebPT is the top EMR solution to consider for end-to-end management of your private physical therapy practice. Unlimited support included at no additional cost. Is WebPT the right software for you? WebPT provides a 100% web-based HIPAA-compliant physical therapy EMR solution. Since 2008, WebPT has grown to 300 employees, and currently serves more than 65,000 users across 9,500+ clinics. With such a strong workforce and wide client base, one of WebPT’s advantages over its competitors is its ability to make weekly software updates, ensuring that clients always have access to the best software possible. We really like that the application allows clients to submit feature requests and participate in beta programs and user testing; that way the customer has a voice in the direction of the product. In addition, WebPT has demonstrated its commitment to helping the PT/OT industry by providing as much free educational content as possible for the community, which is evident from their detailed blog. WebPT’s core strength lies in its documentation and scheduling capabilities. Though WebPT offers its own billing software as well as a full RCM service for an additional charge, we like that it also integrates with other popular billing solutions, such as Kareo, Therabill, CollaborateMD, AdvancedMD, and BestPT/Billing Dynamix. Below, we discuss the key features of WebPT, and how they can benefit your practice. Documentation is WebPT’s core strength. WebPT helps physical therapists increase the accuracy of their documentation, thereby decreasing the number of errors and ultimately resulting in more revenue. By helping users be compliant with all Medicare requirements, WebPT prevents therapy practitioners from being saddled with potentially costly penalties and audits. WebPT also includes everything therapists need to successfully use the new CPT codes for PT and OT evaluations. 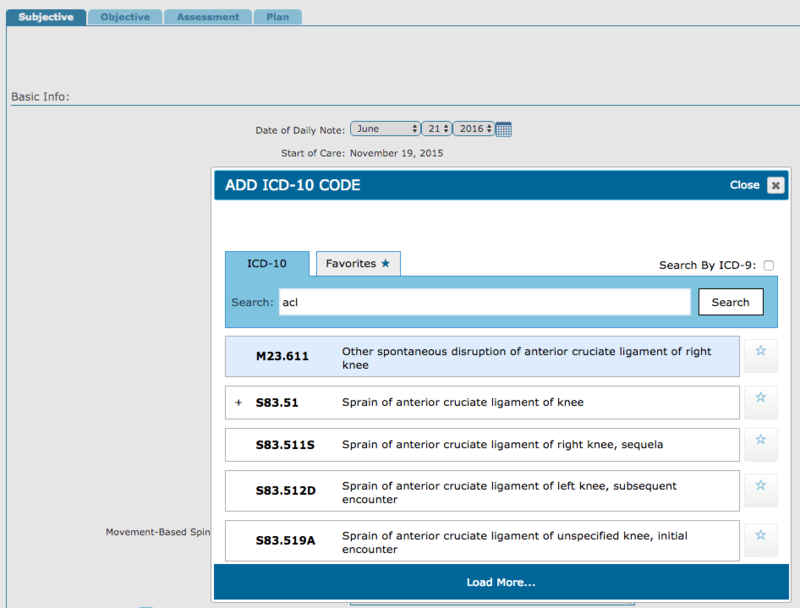 The software also has an intelligent ICD-10 code collector, which allows practitioners to quickly select specific and accurate codes for the patient. The patient record interface is attractive, and keeps track of all of the patients' information in one central location, so that therapists can quickly review each patient’s history. With these documentation capabilities, therapists can develop defensible documentation quickly, and spend more time with patients. Scheduling is integrated with WebPT’s documentation platform, which means that your patient records and calendars are always connected. As with other scheduling software, you can have color-coded appointments for different therapists or specialties, and you can drag and drop to reschedule appointments. The software also provides the flexibility to create custom labeling and color-coding, which allows users to reserve specific equipment or areas (e.g. pool) per patient. In addition, you can schedule recurring appointments, and send automated appointment reminders. There is also a “Lost Patient” log that identifies patients who are due for an appointment, but have not scheduled one, as well as those patients who have failed to show for their appointments. With all of these scheduling features, WebPT estimates that therapists can reduce cancellations and no-shows by up to 30%. WebPT generates a suite of standard reports, so that you can identify areas of strength for your practice, as well as areas for improvement. 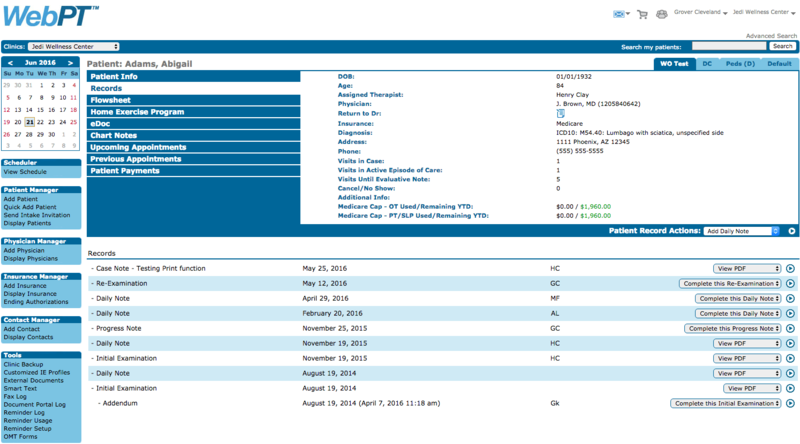 For example, the referral report tracks the sources of referrals to your practice. This is just one example of the standard reports that come with WebPT. Though there are many such useful reports, if you would like a customized report, you will have to generate the report yourself using data that can be exported to a spreadsheet software (like Excel). WebPT has its own billing software, which makes it a convenient all-in-one solution. For users who are satisfied with their current billing software, WebPT also integrates with many popular billing solutions (such as Kareo, Therabill, CollaborateMD, AdvancedMD, and BestPT/Billing Dynamix.) Therefore, it’s easy to leverage WebPT for its documentation and scheduling capabilities while continuing to use your favorite billing solution. 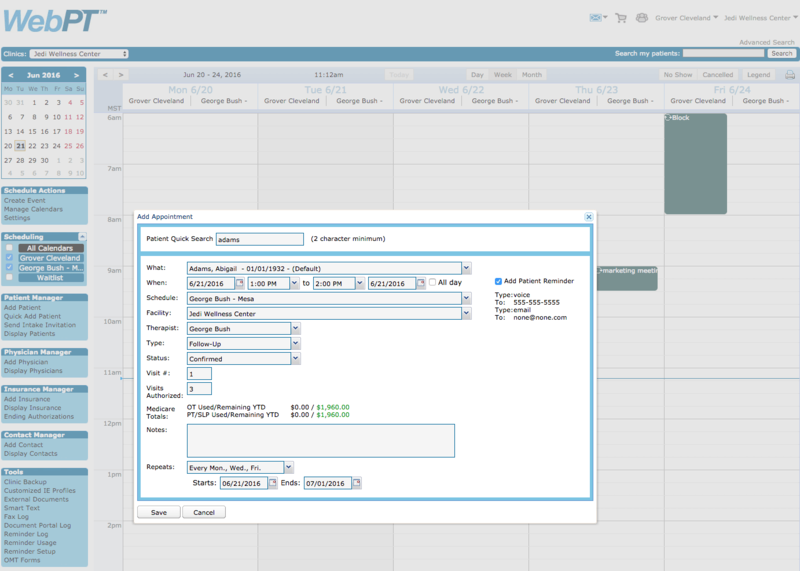 By integrating with other billing software, you can automatically transfer your documentation to your billing solution, thereby minimizing errors from manually entering data into multiple sources. Alternatively, WebPT also offers a full RCM service (for an additional fee), which assigns you an expert billing team, who will submit and follow up on claims, correct any errors found, and appeal denials from insurance companies. Regardless of which route you pursue, having access to an integrated documentation, scheduling, and billing solution will help you ensure that all of your hours are accurately billed in a timely manner. WebPT offers an integrated outcomes tracking solution that allows physical and occupational therapists to quickly and easily collect patient outcomes data. This product features a diverse library of risk-adjusted, evidence-based, industry-accepted tests that are already familiar to -- and respected within -- the healthcare community at large. Examples include the Quick DASH, Lower Extremity Functional Scale (LEFS), Oswestry, Neck Disability Index, and Dizziness Handicap Inventory. Using these tools, therapists can produce data reports that objectively demonstrate their clinical performance to insurance carriers, patients, and referral sources. In addition to empowering therapists to assert their value as medical professionals, WebPT Outcomes allows therapy professionals to enhance their marketing techniques, better assess their -- and their clinical teams’ -- performance through benchmarking; improve patient care; and arm themselves with the data they need for more effective payer contract negotiations. 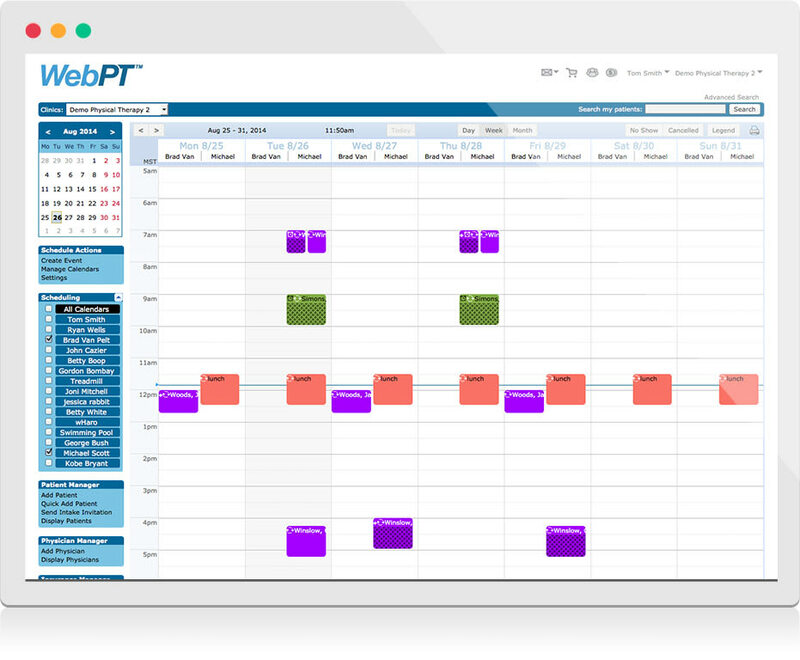 If you are an outpatient rehab therapy clinic looking for a fully integrated EMR solution with especially strong documentation capabilities, WebPT is a top solution to consider. While the majority of its customers are private practices, WebPT is also a valid option for outpatient hospital facilities. Given its rich set of capabilities, WebPT is ideal for both large and small clinics looking for an end-to-end practice management solution. If your practice would benefit more from software that specializes in billing rather than documentation, you may want to start your search by looking at some of WebPT’s billing partners, such as BestPT/Billing Dynamix or Kareo. You can then integrate your billing software of choice with WebPT’s documentation platform, to round out your practice’s software solution. To learn more about WebPT, you can visit their site here. You can also read our interview with Dr. Amy Brannon, owner of T.O.P.S. Physical Therapy and Osteopractics, to learn why she chose to use WebPT over other EMRs on the market, and how it has benefited her clinic.